American Airlines is investigating an incident captured on video showing an argument that broke out after a male flight attendant reportedly hit a female passenger with a stroller while she was holding her baby. The incident occurred Friday on Flight 591 from San Francisco, California, to Dallas-Forth Worth, Texas. In the two-and-a-half minute video uploaded to Facebook by another passenger, Surain Adyanthaya, a woman is seen sobbing while carrying a baby and pleading an airline employee for her stroller back. "You can't use violence with a baby," the woman says. "Just please give me my stroller back." Two American Airlines employees are consoling the woman when, seconds later, a male passenger stands up and demands the name of the person who "did that with the stroller." "I'm not going to sit here and watch this," he says in the video. "What's that guy's name that did that with the stroller, I want to know who did that with the stroller." A tense confrontation between the male passenger and a flight attendant then breaks out. "You do that to me and I'll knock you flat," the passenger says, with the attendant telling the passenger to "stay out of this." Seconds later, the passenger steps into the middle of the aisle and the attendant urges "Come, hit me." Spokesperson Leslie Scott said American Airlines' policy allows each customer to bring one stroller under 20 pounds onto the plane. Any stroller that is larger must be checked at the ticket counter. Scott said the woman was advised that the stroller needed to be checked at the gate. The woman had twins, Scott said, and may have brought a double stroller onto the plane. Scott was unable to confirm whether a crew member hit the woman. 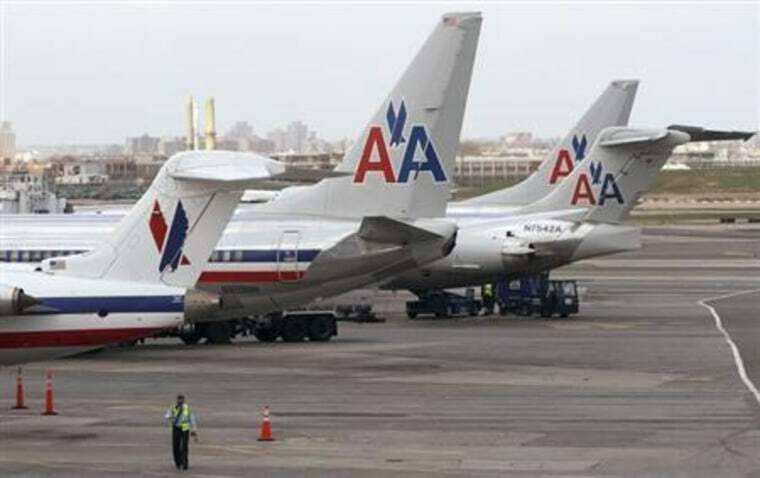 "We are often right in the middle of those conflicts because we are trying to manage them and deescalate them from becoming a bigger problem," said Sara Nelson, head of the nation's largest flight attendant union, which does not represent American Airlines. In a statement released Saturday morning, the company said the employee has been removed while an investigation is undertaken. The woman and her family chose to take a different flight and were upgraded to first class for the remainder of their international trip, the airline said. "We are deeply sorry for the pain we have caused this passenger and her family and to any other customers affected by the incident," the statement read. "The actions of our team member captured here do not appear to reflect patience or empathy, two values necessary for customer care. In short, we are disappointed by these actions." Another passenger, Olivia Morgan, witnessed the events unfold as she was about to board the plane with her 8-year-old daughter. The two saw the flight attendant violently yanking the stroller out of the woman's hands and nearly hitting the baby. “He is clearly like enraged and nearly hits the baby in the head, which is the like the shocking part of it," said the 44-year-old from San Francisco, California, adding that the crew member placed the stroller in an area where bags were being gate checked. Morgan said she informed the flight attendant that he nearly hit a baby, and he violently yelled at her in response. After taking her seat, Morgan said she walked to the front of the plane to comfort the women with the children, whose hands were visibly shaking. “Why would you ever be violent with a passenger let alone a passenger that’s holding a baby?” Morgan said. The flight was grounded for an hour after the incident, Morgan said, and the crew did not acknowledge that a crew member was involved in the issue. The video comes nearly two weeks after a clip spread through social media showing a United Airlines passenger, David Dao, being dragged off a flight bloody for refusing to exit a packed flight. Three days after the video surfaced, the man's lawyers said he suffered a "significant concussion" and a broken nose, along with losing two front teeth.